Welcome to Day #3 of Chocolate and Alternative Sweetener Theme Week. 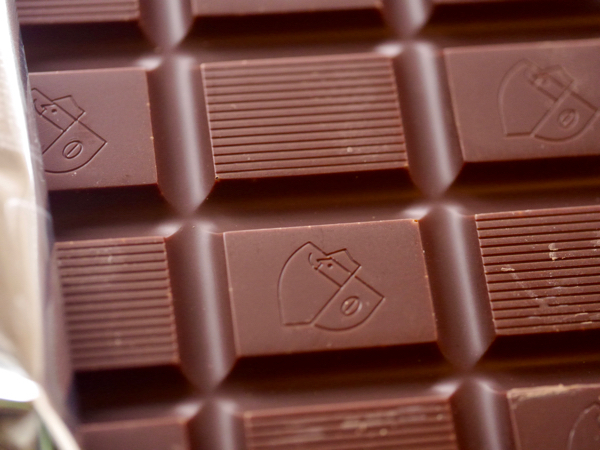 This bar was made in Peru for Pascha Chocolate Company (Toronto, Ontario, Canada). 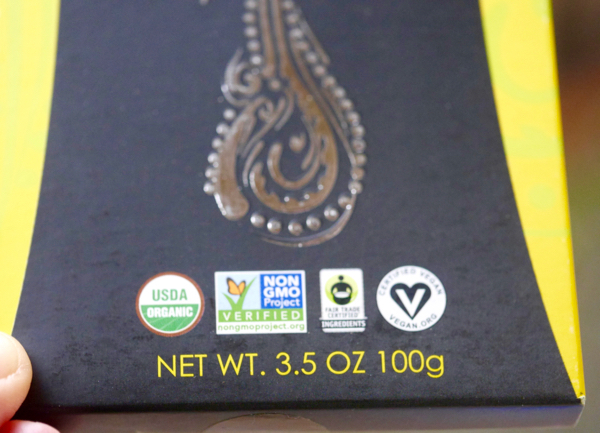 Pascha uses Organic Cane Sugar in their bars, but also uses alternative, plant-based sweeteners and inclusions. 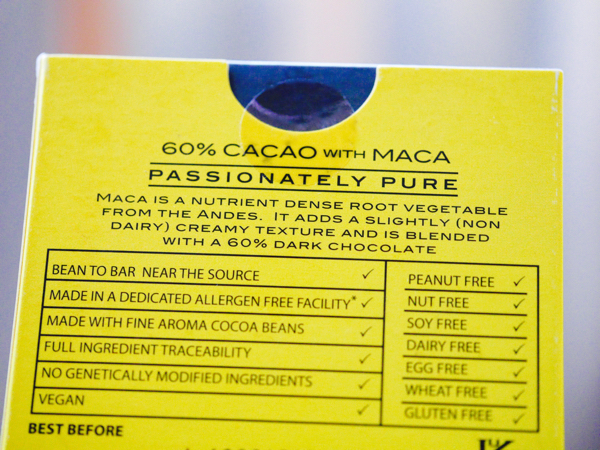 The packaging on this bar described maca as "a nutrient dense root vegetable from the Andes. It adds a slightly (non dairy) creamy texture and is blended with a 60% dark chocolate." 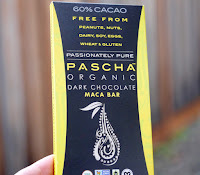 Unlike yesterday's Pascha bar with lucuma (a naturally sweet plant from South America with a caramel flavor note), this bar was less about replacing cane sugar and more about adding a slightly sweet and creamy flavor and texture to the chocolate. The aroma of this Pascha bar was a little different with a hint of a sweet vegetable smell. The taste was sweet, smooth and pleasant. 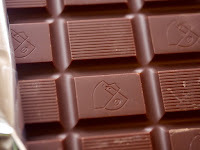 The sweeter taste to today's bar base was likely also due to 60% Cacao. 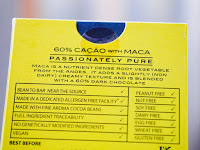 Yesterday's Pascha dark chocolate bar with lucuma was made with 70% Cacao. 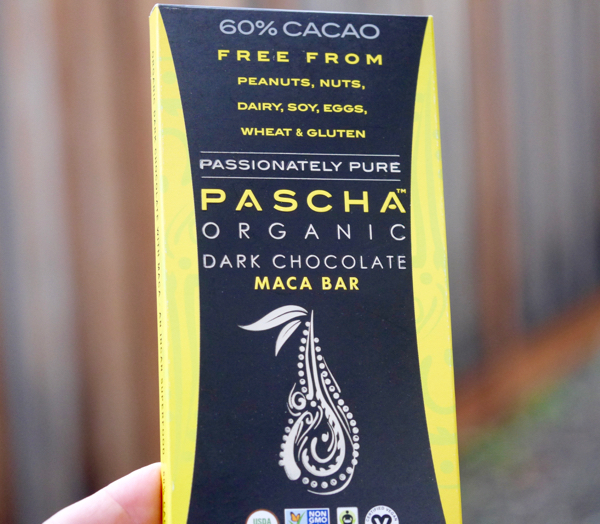 Both Pascha bars were organic, vegan, Non GMO Project verified, and free from major allergens: peanuts, nuts, dairy, soy, eggs, wheat and gluten.